I thought I better start a project post / log so you can all share in my delight, misery, splendour & despair as I move through my first project. Abracadabra - for my next trick, I will be changing a pig of a motorcycle into a rather stylish little cafe racer.........................hopefully. 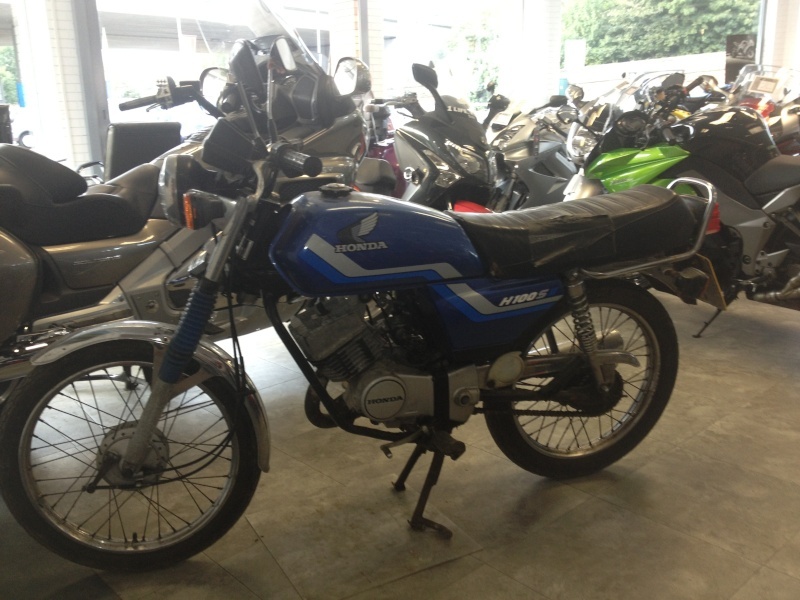 The bike is a D reg 1987 1 owner bike with 17k miles on it. The previous owner bought another bike in 1998 and just put this one in his shed, there it lay for 15 or so years, never moved, never started, just in essence left to rot. The bike was in a bad way when I got it but miraculously did start after only a couple of attempts so hopefully the engine is fine. The rest of it though..............................hmmmmm. I am going for a minimal but stylish look and will be doing a full nut and bolt job. 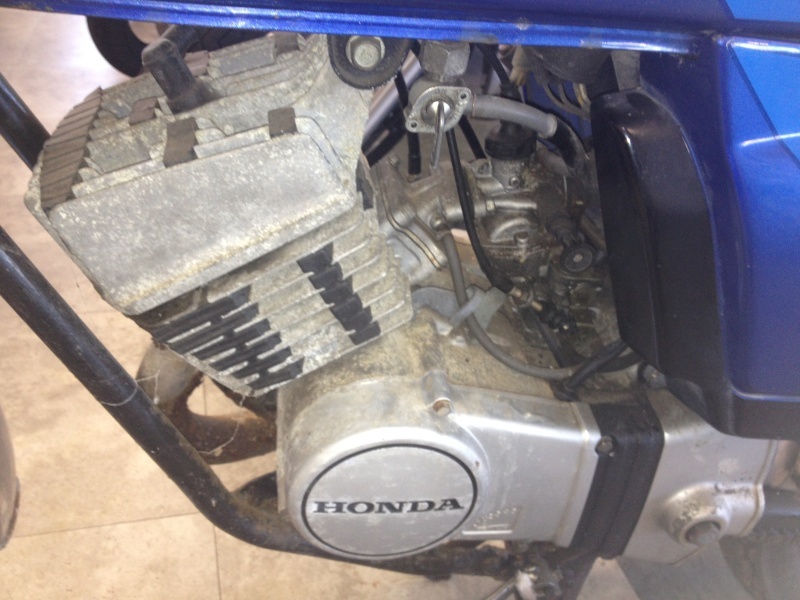 Why a H100 you ask :)Well, I already have a CBR600RR so don't need a fast bike, I just want something else to pootle about on, it only cost me £50 and it is a two stroke single with barely any electrics (6v) so should be straight forward ish to work on. I am picturing everything at the minute so will give a good number of updates. Interesting choice, I'm looking forward to the build! Here are some of the nasty bits on its way to the full strip down. At this point I was removing everything so I could get to the bare frame. 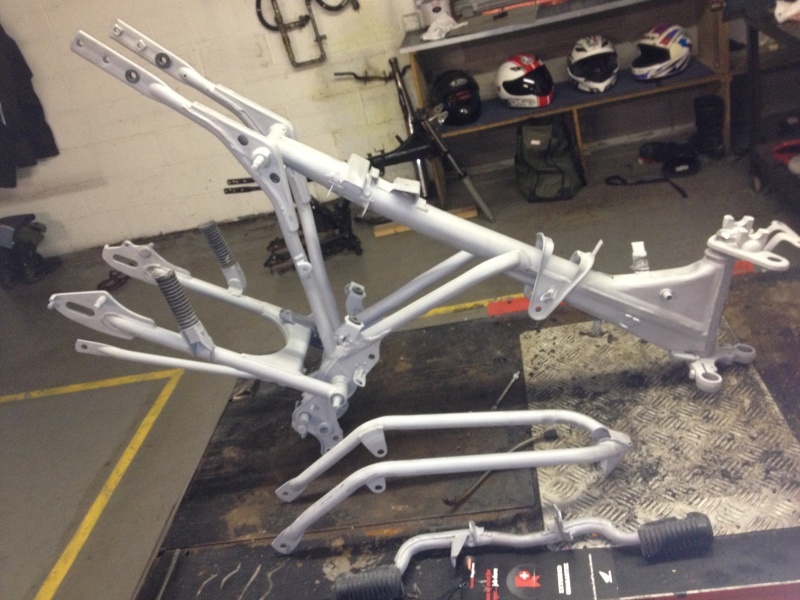 My plan is to start with a freshly painted frame and then work on each part one at a time before fitting it. 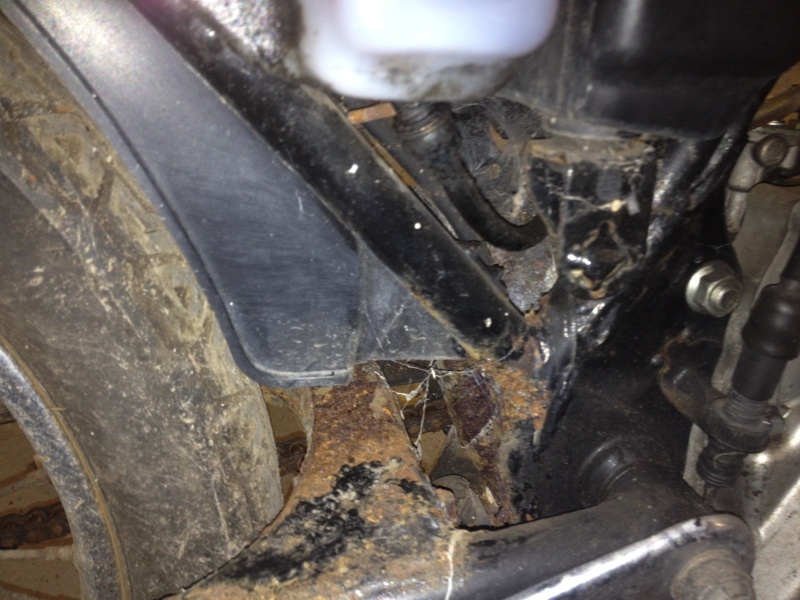 I was pretty lucky with seized bolts, most of the strip down was straight forward but the swinging arm bolt...................WOW. That sucka does not want to ever ever ever come out. 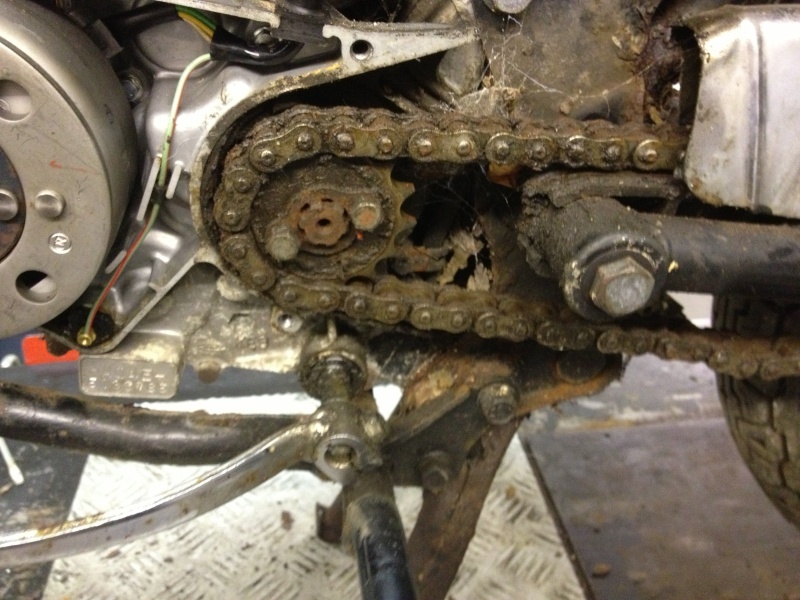 I ended up with another frame due to that bolt, same age, same plate and only cost me £20 so could have been worse. I do have a spare frame though lying around though now as well as loads of boxes of old parts. Ebay anyone..
Once the bike was stripped down I decided to sand and strip the frame and and try to clean up the engine a little. To be honest, there was that much horrible muck stuck within the recesses of the frame that I knew it needed to be sand blasted if the paint was ever going to stick. Whilst I was doing this, the engine was also pretty oxidised in sections that were difficult to get to I thought I may as well get the engine blasted too. 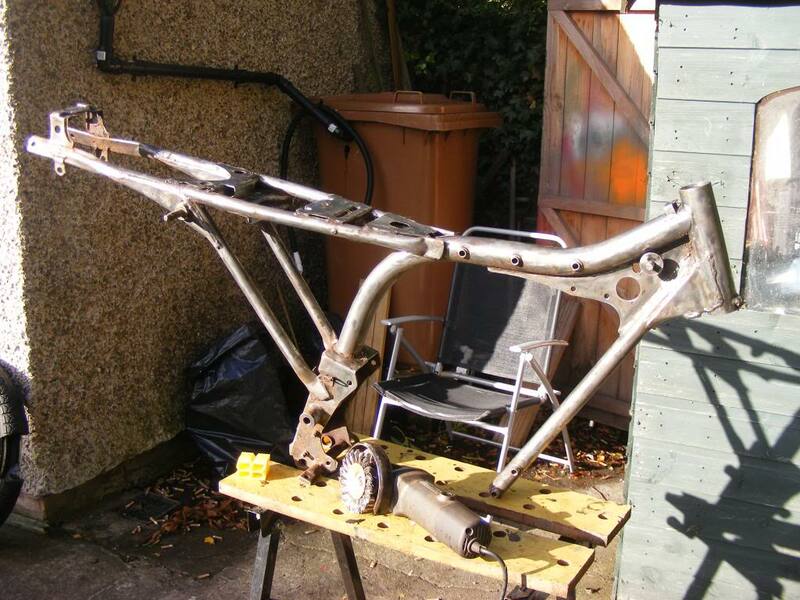 I found a local guy that would sand blast the frame and swinging arm and also soda blast clean the engine for £80 all in. 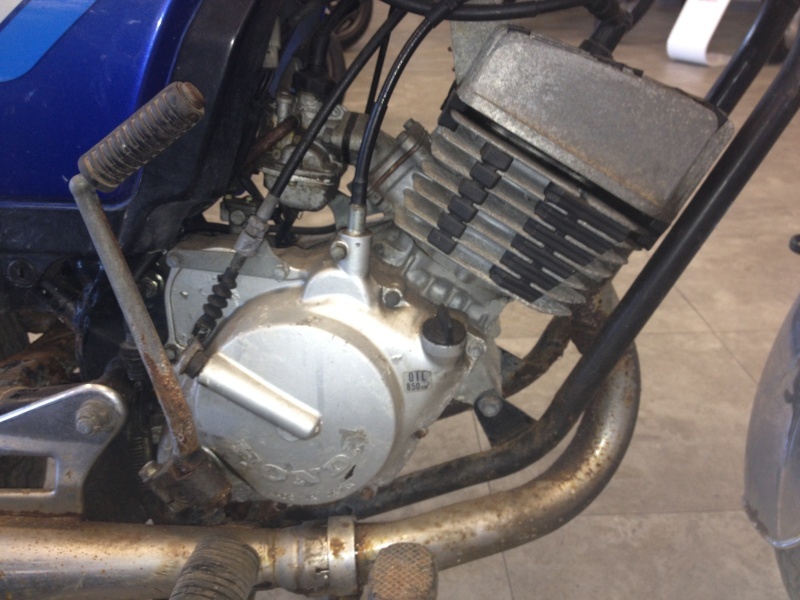 I am due to collect the frame and engine from him in an hour or so but here are the before pictures. Im on the Wirral so we are almost neighbours ! Got mine stripped like yours but unlike yours mine came apart no problem - only one bolt needed cutting and that was only on the battery carrier ! 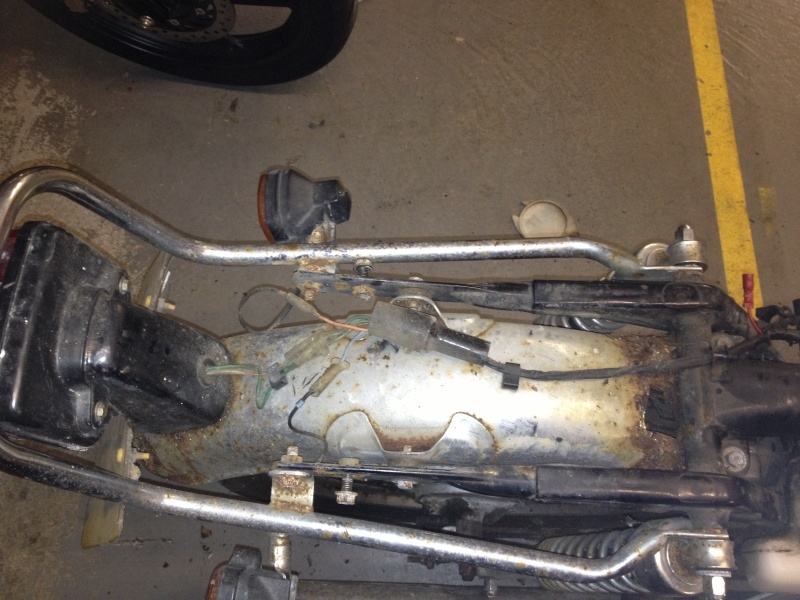 I stripped the frame with a combination of angle grinder with a wire brush and wet and dry - looking back would probably have been easier to blast it like you. I'm going to prep the engine by hand and paint it with high temperature paint (black) seen one done where the edges of the fins were rubbed back to shiny aluminium, looked very smart, so I will probably do that. 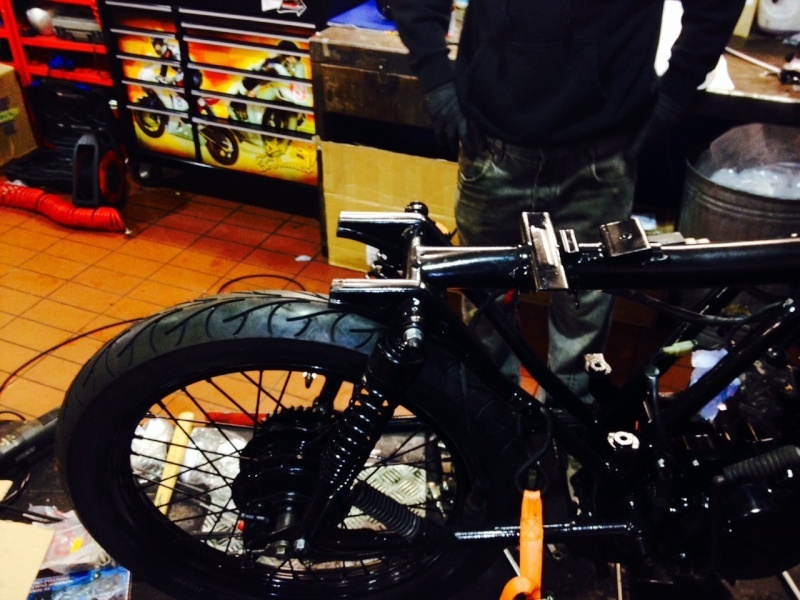 We will probably be working on the bikes in parallel so it will be interesting to compare progress via forum posts. Mike is a 'winter project' so I'm aiming to have it on the road in the spring. Good luck with your build and I'll look forward to seeing you progress. 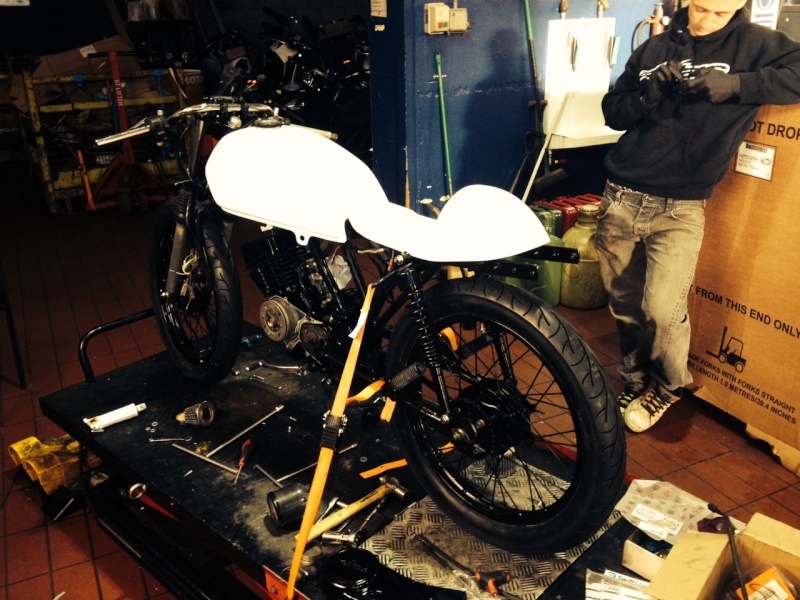 Nice bike to project too. They are very very similar in size and shape. Ocotoro is also doing a H100 project at the minute so it will be interesting to see the differences between the three little Hondas. On another note, I actually live in Ellesmere Port so even closer to the Wirral. 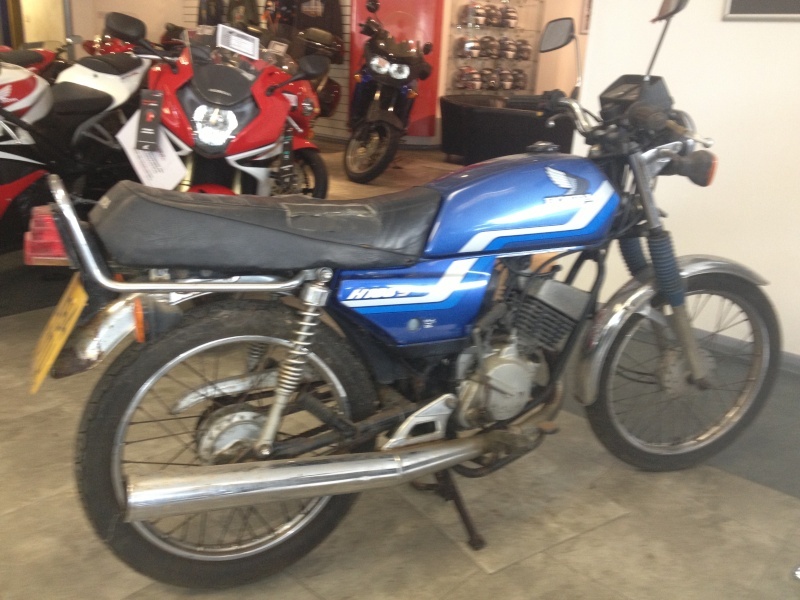 I am also aiming to have the bike on the road for Spring. 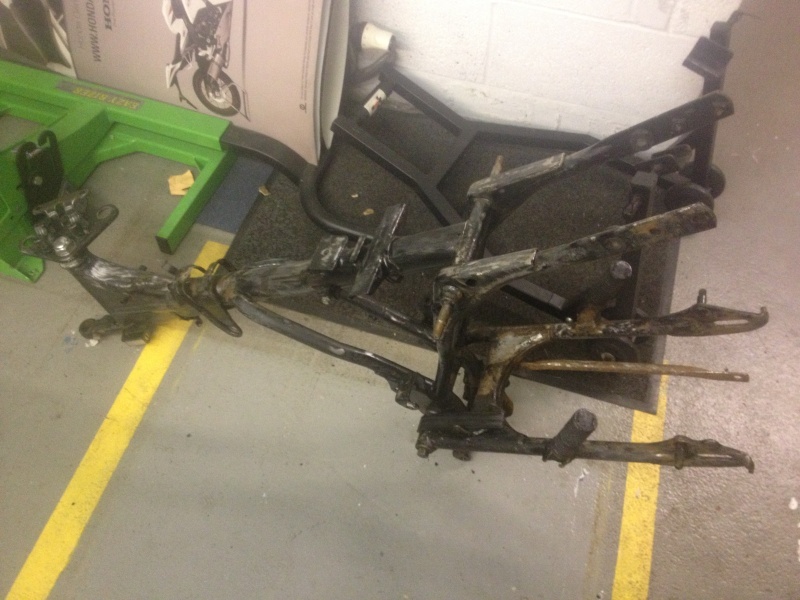 The frame and engine were blasted today, the frame is awesome, no paint on it anywhere, down to bare metal. 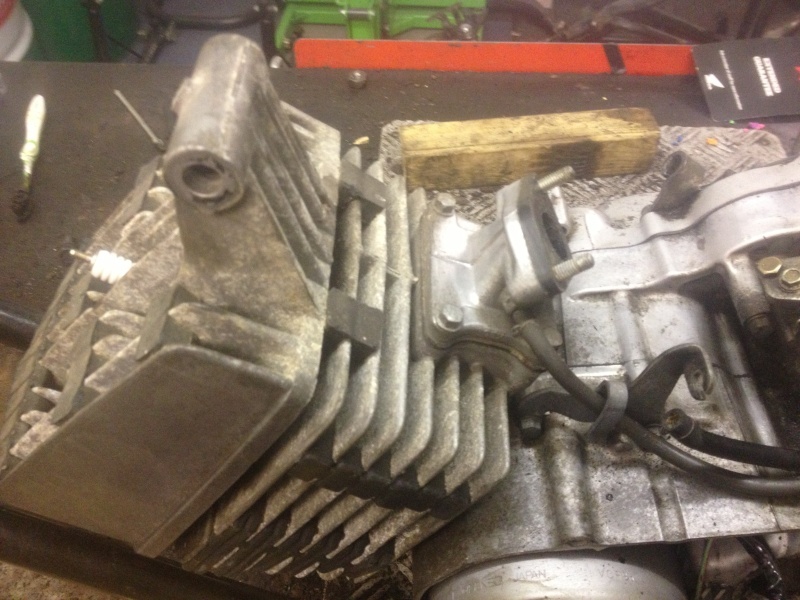 The engine looks a bit weird at the minute and I wont know how it will turn out till I give it a good rubdown tomorrow, at the minute its just covered in dust. I will post pics of both the frame and engine tomorrow. So after picking up the frame and engine from the sand & soda blasting company, they look like this. 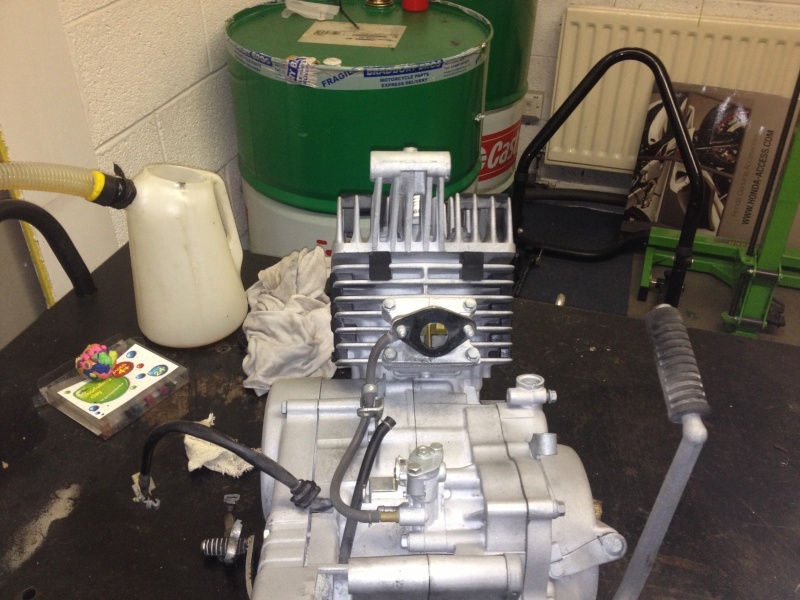 The engine needed a wet wipe off and then I wiped some WD40 into it, once the engine cases are painted up it will look really good. This is the frame after the first coat of primer. Going to do a couple of coats of primer, sanding in between before doing 3-4 coats of gloss black and 1 final coat of laquer. Hey ! The frame and engine came out great. I went down the 'chemical route' with the engine and casings - bad call ! used nitromors, what a load of rubbish. EU regs a couple of years ago took all the good aggresive chemicals out of it and now it just doesn't work. I remember the time when you painted it on, the paint bubbled up as you watched and you scraped it off in one complete film. Now it just softens the paint and it's a nightmare to get off !! 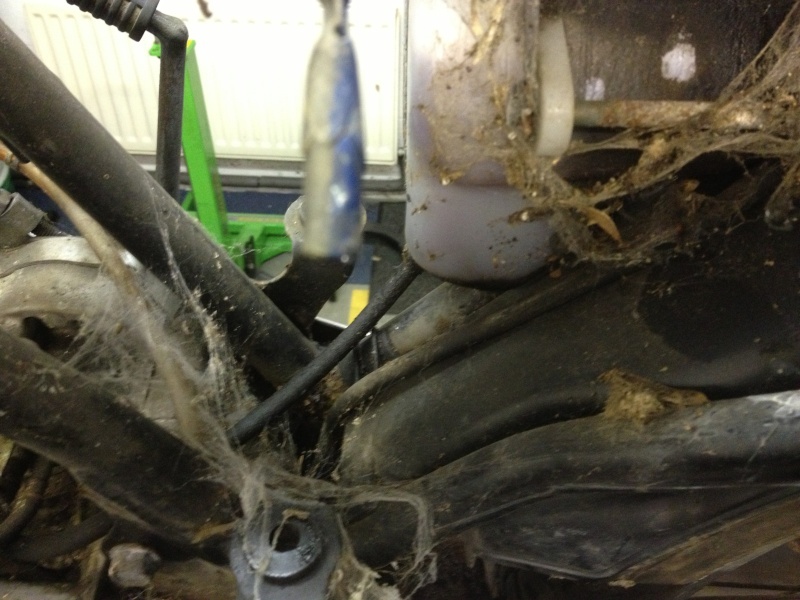 Same with engine cleaner / degrease. Used to use GUNK or JISER, paint it on, everything dissolved, hose it off and you could eat your dinner off the resulting shiny surface, post EU 'save the planet' and now you scrub it in, hose it off and nothing much has changed ! I have a load of new parts already and some more on there way. This is when the build gets interesting from here. Hi. Why are you going for a black frame ? The cafe racer style makes the frame really 'stand out' I'm going for a yellow frame with british racing green other bits. 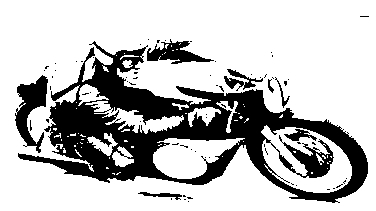 If you let me know your colour sceme I will do a graphic to visualise what it will look like. 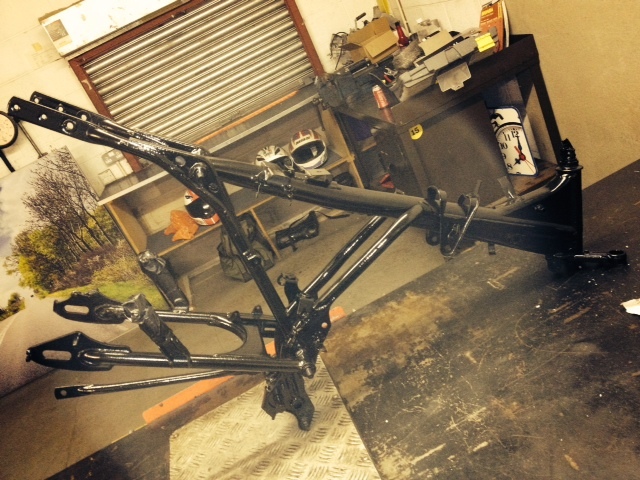 I am painting the frame black as I am going for a black /white /silver colour scheme. White tank with either a black tank protector or a black stripe with silver Honda decals, silver engine, silver polished forks, chrome handlebars, chrome levers, black wheels, black rear suspension springs, black chain guard and either a chocolate or deep red brat style seat. Sounds like a great colour scheme - looking forward to seeing it take shape ! 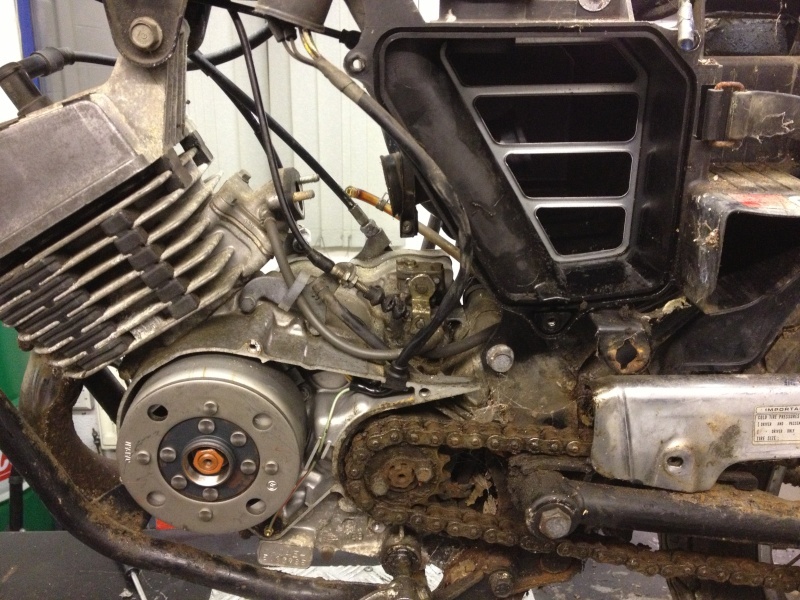 looking forward to getting it stripped down and getting cracking. i think mine'll be wire/kurust combination for cleaning up the frame. 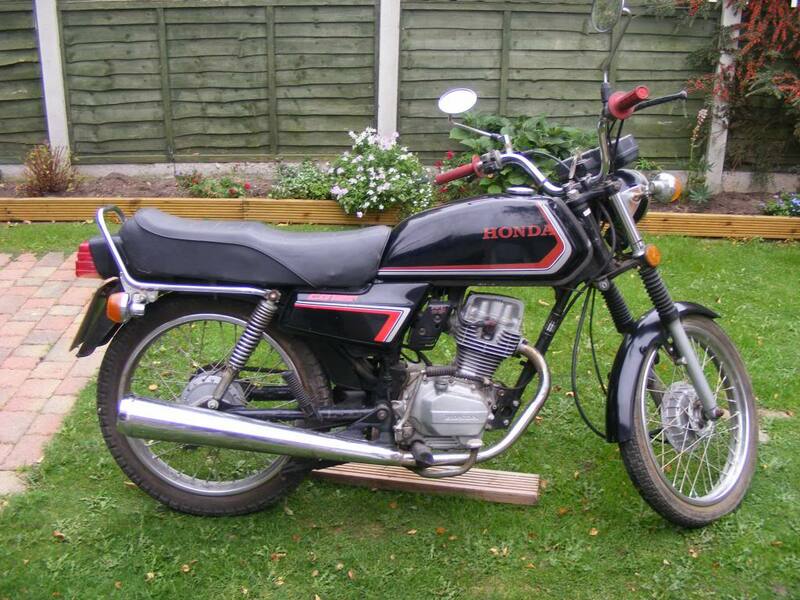 Good to hear it, 3 mini Honda projects all going at once. 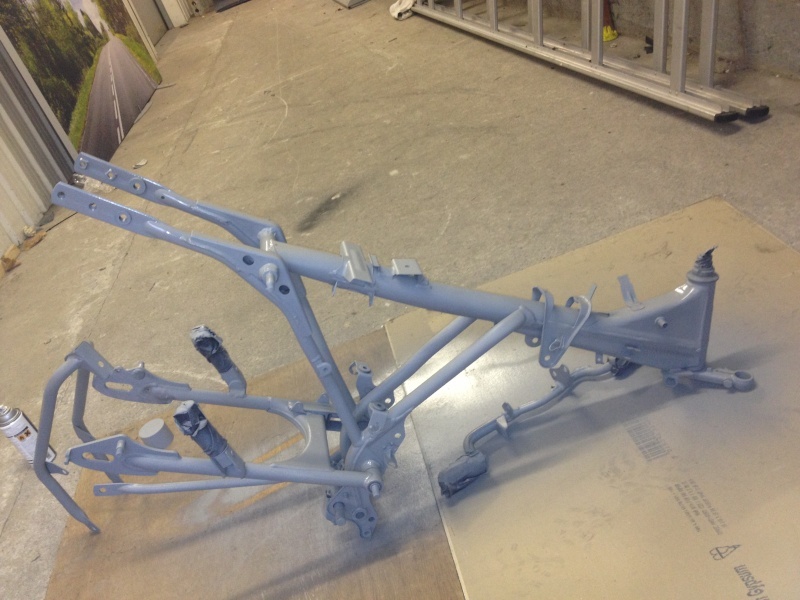 I am just at the painting / sanding stage of the frame so that is why there has been no update for a while. I am on about coat number 6 with sanding occasionally, just need one final coat and then two or three coats of lacquer will finish it. Meanwhile, the wheels, tank, rear shocks & headlight are at the paint shop so should be ready in a few weeks too. 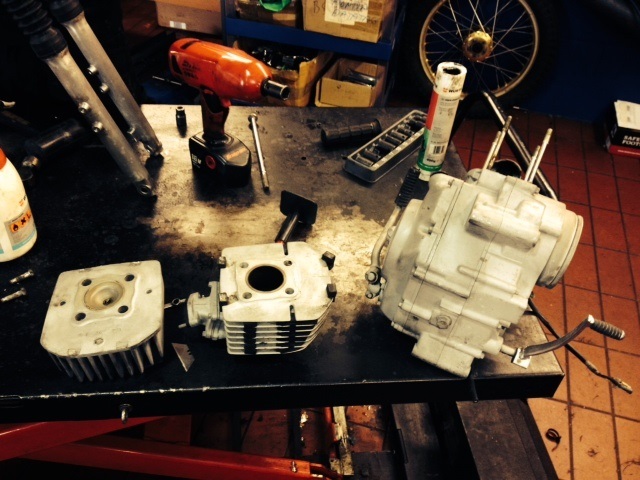 Good to see the 3 little Honda projects progressing. All the food, drink etc over Christmas got in the way a bit but I have made some progress with the prep of the various components. I am prepping everything first and then will have a good weekend of spraying everything. 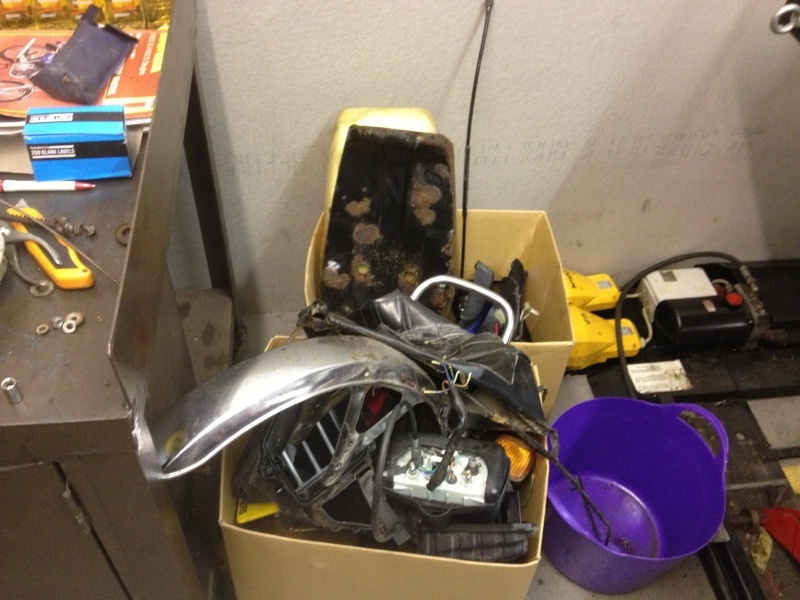 Not worth posting any pics at this stage, it's just a big pile of dull looking rubbed down odds and ends. I enjoy the spraying phase - couple of days work makes a total transformation. Got some black and yellow vinyl (faux leather) to do the upholstery on the seat so that should co-ordinate nicely with my colour scheme. Looking forward to seeing progress posts from you both. Not posted for a while and I am starting to see how these projects can take months and months. Its not the work involved more getting the spare time to get to the work. So anyway here is a picture of the finished frame. This had had 2 coats of primer, 6 coats of black Hammerite type paint and the finally two coats of lacquer. The Picture doesn't do it justice really, I'm pretty pleased with how it has come out. 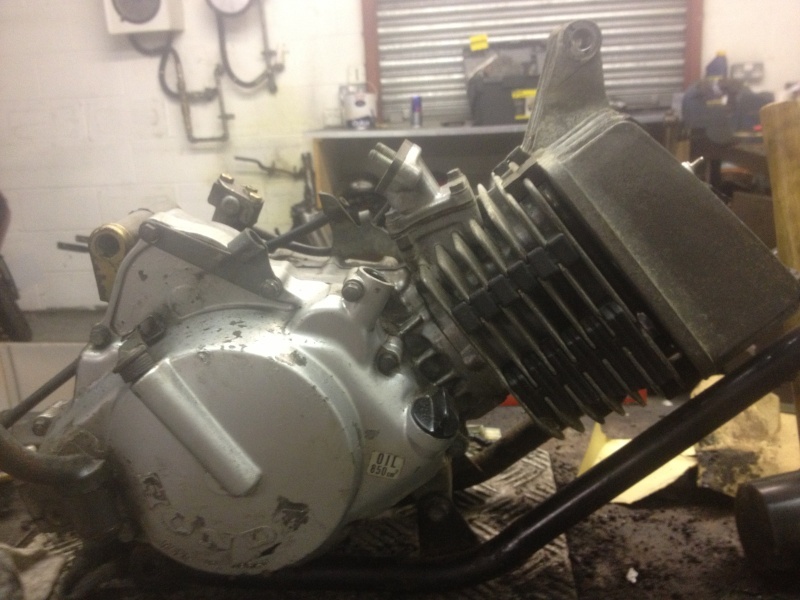 Tomorrow I will be stripping the front forks, changing the seals, oil etc etc and also if I get enough time I'm going to take the cylinder head off to get a look at the piston. Planning to order a new piston kit but just need to make sure it is not oversized needed. It’s looking good so far. I know about that spare time problem I may get an hour or two total during the week if I’m lucky. I have been in the garage at 6am on the weekends and I can work till about noon until the family needs attention. I’m up by 5:30 most days anyway work or not so I try to make good use of it. Looking good ! You seem to have got a really good gloss finish. Did you spray the clearcote ? I'm still messing about rubbing stuff down, looking forward to when I can hit everything with the spray gun. Then the progress should accelerate. Like you say, everything seems to take longer than you expect but it will all be worth it in the end. The paint was all from aerosol cans including all the lacquer. If you spray far enough away with constant movement with the can, you can get a nice finish. The main point though is to sand between coats, nothing major but enough to smooth out the paint drips (if any). With enough care, which you obviously took, you can get a great finish from 'rattle cans'. followed by 4/5 coats of cellulose. (50% / 50% mix with thinners) I finish off with a couple of coats of 25% celly and 75% thinners mix and it floats out to a great gloss, without the need for clear coat. To get an even better gloss you can wet sand (2000 grit) and buff with a polishing compound. Ends up like a mirror ! I won't bother with this stage on the bike as none of the panels are big / flat enough to need it. Keep posting the pics, I'm enjoying this thread. Not done an update for a while. Work got in the way and I also had to wait a lot longer than first thought to get the bits I needed to be painted. 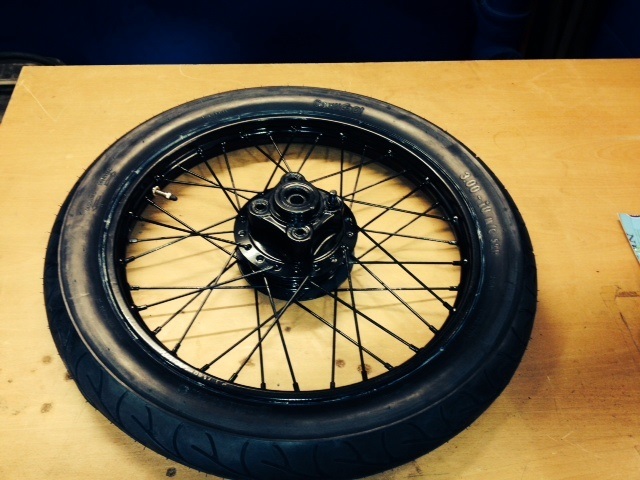 I have now had the wheel rims, rear shocks, chain guard and rear brake pedal powder coated black. I have also had the tank painted white but am yet to have the decal and paint scheme done on this. So today I decided to get things moving. 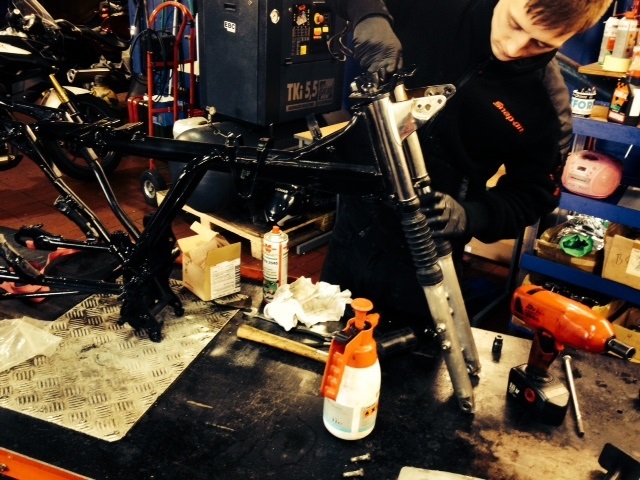 First off the forks were stripped & cleaned before adding new forks seals, fork oil and fork gators. 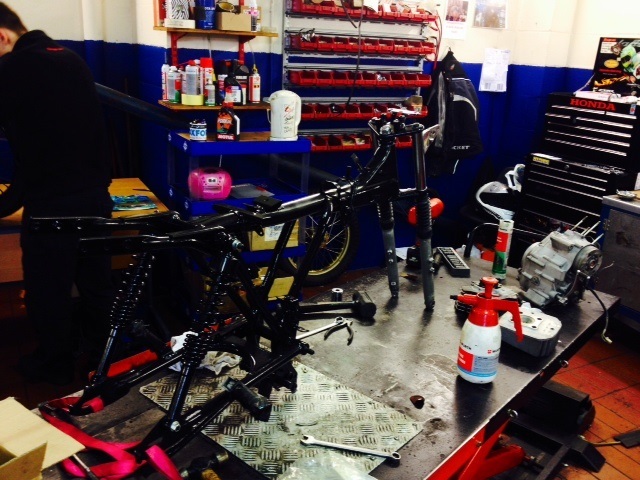 We then added the rear shocks back onto the bike. 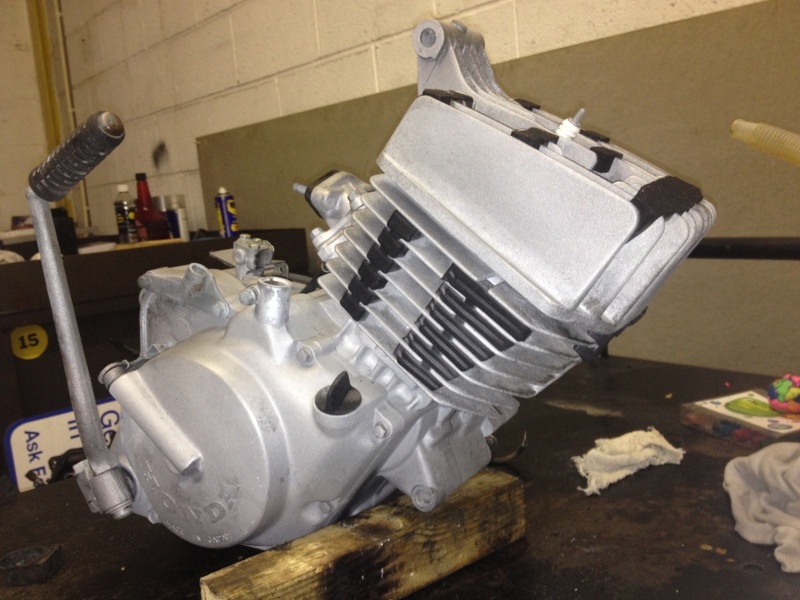 Then we stripped the engine, cleaned it all up inside the cylinder and tried to do a little porting whilst we were in there before fitting a brand new piston. 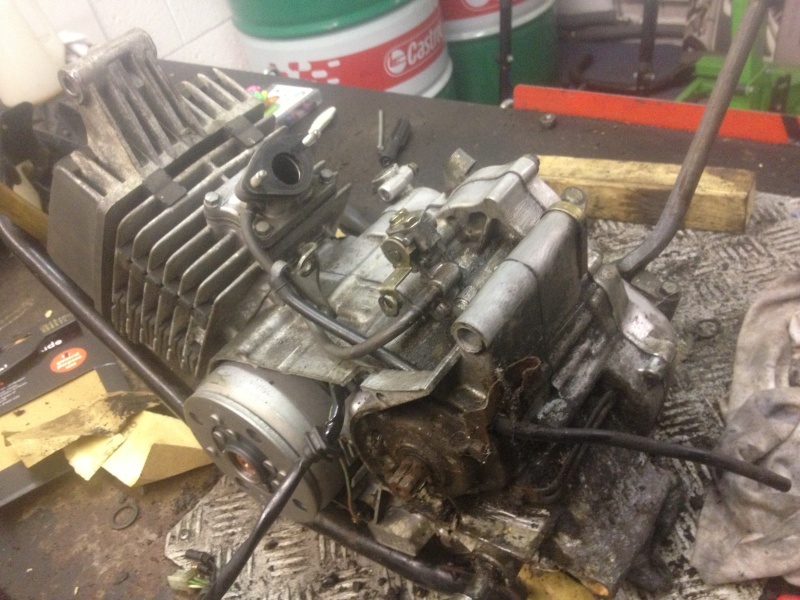 The engine was then put back together. 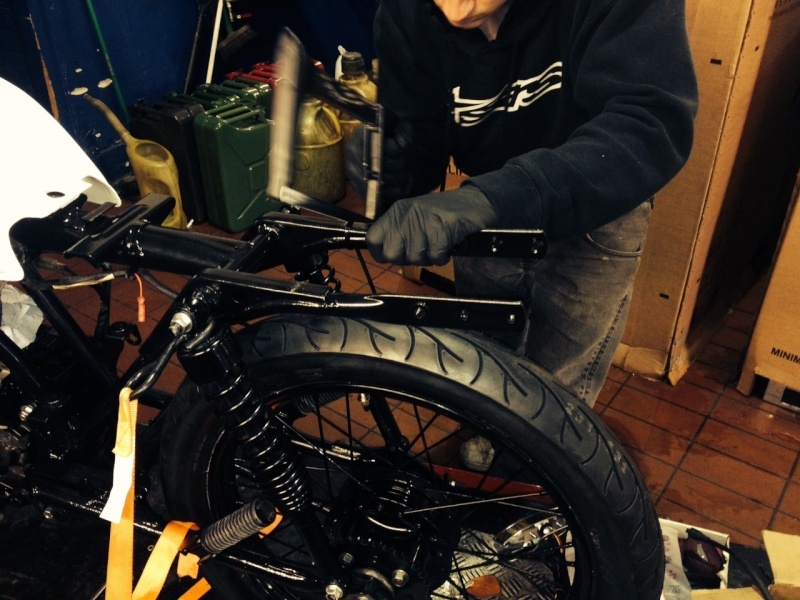 Next the wheels were put onto the bike, along with the new handle bars and new brake levers. Quite a lot done today but still a good amount to do. I plan to have it all finished and MOT'd within a couple of weeks. I have pretty much all the parts I need now so can really crack on from here. More updates to come once the engine goes in this week. The only things white will be the tank and rear seat section (albeit with black foam as the seat), not planning on using the side panels anymore, just plan to have a battery between the engine and rear wheel to give it a stripped down clean look. Not sure if its old english white, just asked for gloss white in colour. To be honest, the tank looks awesome. Few more bits an pieces done now. 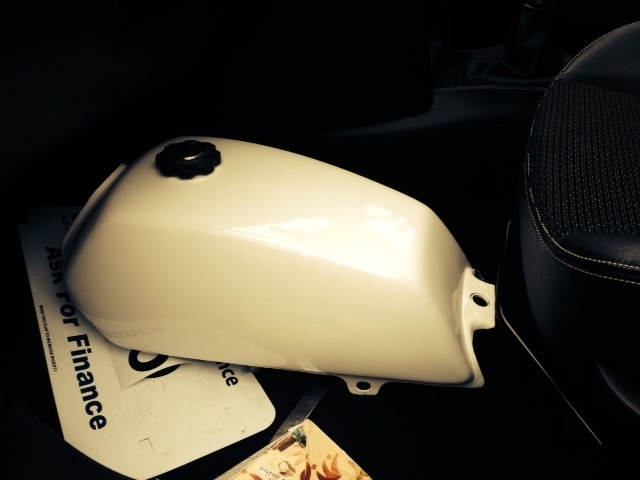 The seat pod is now painted with a nice gloss finish. 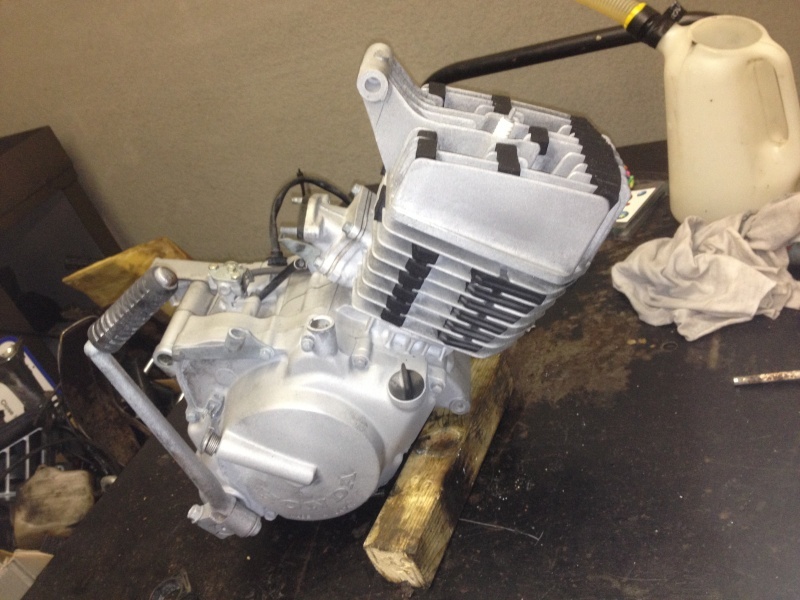 The engine has also been fully painted too, decided on black engine to make the top white pieces really stand out. Did a few things tonight, mainly put the engine back into the bike and put most of the electrics in place ready for lighting fitment. 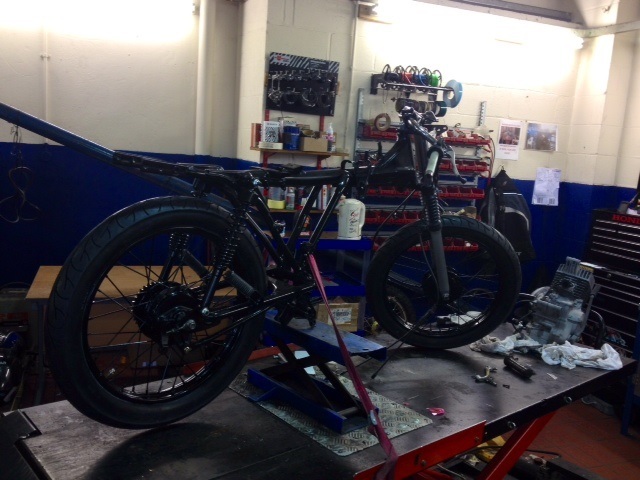 I Mocked the bike up and then cut the rear of the frame so the seat pod is the last part of the bike. We also did a brief mock up before cutting the frame to see how it will look. Its coming on well and once done is going to be a lovely looking thing. looking sweet on the road for the summer ?